The Wooden Viking Double Dragon Shield with Boss may be one of the most intricate and beautiful shields we offer that is still considered fully functional. This Viking-style shield is as rugged and reliable as it is detailed and beautiful. 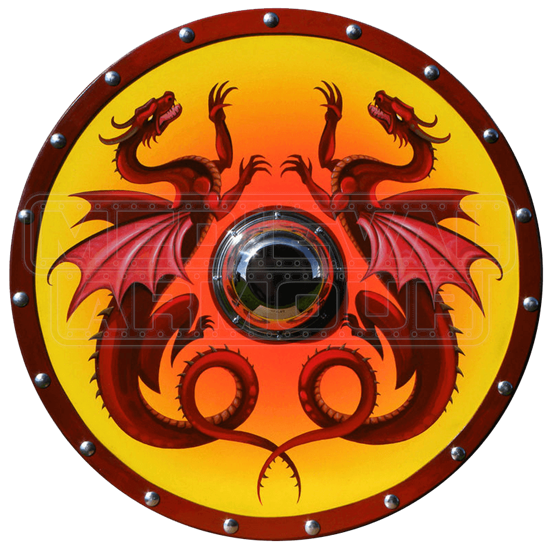 This shield depicts a pair of incredibly detailed red dragons that have been painted around the center of the shield. These dragons rest on a background that consists of a carefully airbrushed sunburst effect in orange and yellow. At the very center of the shield is a metal boss. This metal fixture is quite strong and has been polished to a mirror-finish. The shield has a red border studded with stainless steel studs and features reinforced trim and edging, which makes it that much stronger and more effective in actual combat. Despite being combat ready, this shield is nothing less than fine art in quality. It measures approximately 28 inches in diameter and is made of 0.5 inch thick plywood. The plywood has been treated and stained a rich mahogany color, which is visible on the back of the shield. A pair of leather straps on the back of the shield makes it easy to carry, hold, and use. One leather strap goes around the forearm and the other is gripped securely by the hand. For additional comfort, soft black fur has been attached along the arm-rest as well. A high-quality topcoat and finish have been applied to the surface of the shield as well, to help preserve and protect this shield throughout the years. While this shield is combat-ready and fully functional, it seems a shame to risk marring the beautiful appearance with authentic battle damage. Otherwise, it is hard to go wrong with the Wooden Viking Double Dragon Shield with Boss. It is a top-notch item that medieval and Renaissance-enthusiasts are sure to love for years to come.